At last, the city district government has approved the final design of long-awaited Chandni Chowk Flyover and Chur Chowk Underpass here on Tuesday and work is expected to start on these two projects next month. Earlier, Punjab government handed over these mega projects, costing Rs2billion, to Rawalpindi Development Authority (RDA) and ordered to finish it within three and half months. However, Punjab Chief Minister Mian Shahbaz Sharif took over the projects from Rawalpindi Development Authority (RDA) and handed it over to Communication and Works (C&W) Department, Punjab. Superintendent Engineers (SE) Highways, Rawalpindi Circle, Farhat Munir presented the final design and plan of Chandni Chowk Flyover and Chur Chowk Underpass to Commissioner, Rawalpindi Division, on Tuesday. Other senior officials of road and building department were also present at commissioner s office on the occasion. According to Executive Engineers (XEN) Machinery and Maintenance (M&M) Rana Basharat height of Chandni Chowk Flyover would be 5.10 meters and its length would be 588 meters from Chandni Chowk to area near Rehmanabad. The flyover would be built on 13 pillars and would be double track and comprise three lanes on each side and each of its track would have a width of 11.2 meters. The flyover would be signal free, but signals would be installed on roads under the flyover to control traffic. He said that diversions for vehicles moving under the Chandni Chowk Flyover would be made for people intending to move towards Sadiqabad, Rawal Road and Commercial Market. 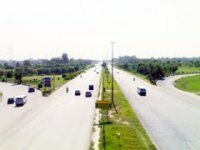 The traffic moving straight on flyover would not be disturbed, however, traffic moving towards the side areas like Sadiqabad, Rawal Road and Commercial Market would take the roads under the flyover and would be controlled via traffic signals, he added. He said that total Length of Chur Chowk Underpass would be 786 meters that 273 metres towards Peshawar Road and 513 meters towards Mall Road, Saddar, whereas the height of the underpass would be 5.10 meters. The length barrel of underpass would be 60 meters. It would be a double track comprising three lanes, which would be signal free. We would divert traffic towards Misriyal Road, Westridge and Charring Cross through a proper plan, which would be displayed. The traffic moving through the underpass would be signal free, but traffic moving overhead would not be signal free, he added. Commissioner Rawalpindi Division Captain (r) Zahid Saeed told The News that there is drainage problem at Chandni Chowk Flyover, but not at Chur Chowk Underpass. The project would be completed with an estimated cost of Rs2 billion and it would be completed within the deadline of three and half months. We have given contract to National Logistic Cell (NLC) to complete the projects, he added. After the approval of Punjab chief minister work on the flyover and underpass would kick off, he assured.